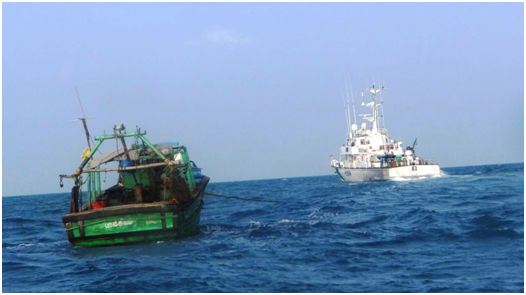 On Tuesday, Coast Guard rescued nine fishermen whose boat had overturned some 80 nautical miles into the sea off the coast of Chennai. The rescued fishermen are expected to be brought ashore by Thursday. The nine fishermen from Kasimedu went to the sea on June 17. They were on a gill net boat owned by Senguttuvan. Their nets got sheared but they continued fishing through the next day. Heavy wind overturned their boat. These fishermen contacted their fellow fishermen on wireless and they informed them it would take three hours for them to teach the spot. As the engine space got flooded, the boat began to sink. Coast Guard was alerted who went and rescued the fishermen. “We are happy that the fishermen were rescued. We have lost a boat that cost some Rs. 50 lakh and are hoping we would be compensated,” says Balamurugan, son of the boat owner Senguttuvan. Fishermen association members say there are several problems in getting insurance compensation for such accidents and loss of boats. “The compensation we get is never adequate,” says fishermen association leader Bharathi. “If our claim is small, the settlement is quick and adequate. If the claim is large, insurance companies ask that the accident spot has to be identified accurately, which we are unable to do,” he says.